Meyer-Lindenberg, A., Domes, G., Kirsch., P. & Heinrichs, M. (2011). Oxytocin and vasopressin in the human brain: social neuropeptides for translational medicine. Nature Reviews Neuroscience, 12, 524-538. Eisenegger, C., Naef, M., Snozzi, R., Heinrichs, M. & Fehr, E. (2010). Prejudice and truth about the effect of testosterone on human bargaining behaviour. Nature, 463, 356-359. Eisenegger, C., Naef, M., Snozzi, R., Heinrichs, M. & Fehr, E. (2012). New evidence on testosterone and cooperation. Nature, 485, 5-6.
von Dawans, B., Fischbacher, U., Kirschbaum, C., Fehr, E. & Heinrichs, M. (2012). The social dimension of stress reactivity: acute stress increases prosocial behavior in humans. Chen, F. S., Minson, J. A., Schöne, M. & Heinrichs, M. (2013). In the eye of the beholder: eye contact increases resistance to persuasion. Millan, M. J., Andrieux, A., Bartzokis, G., Cadenhead, K., Dazzan, P., Fusar-Poli, P., Gallinat, J., Giedd, J., Grayson, D. R., Heinrichs, M., Kahn, R., Krebs, M. O., Leboyer, M., Lewis, D., Marin, O., Marin, P., Meyer-Lindenberg, A., McGorry, P., McGuire, P., Owen, M. J., Patterson, P., Sawa, A., Spedding, M., Uhlhaas, P., Vaccarino, F., Wahlestedt, C. & Weinberger, D. (2016). Altering the course of schizophrenia: progress and perspectives. Nature Reviews Drug Discovery, 15, 485-515. Chen, F. S., Kumsta, R., Dvorak, F., Domes, G., Yim, O.-S., Ebstein, R. P. & Heinrichs, M. (2015). Genetic modulation of oxytocin sensitivity: a pharmacogenetic approach. Translational Psychiatry, 5, e664. Heinrichs, M., Stächele, T. & Domes, G. (2015). 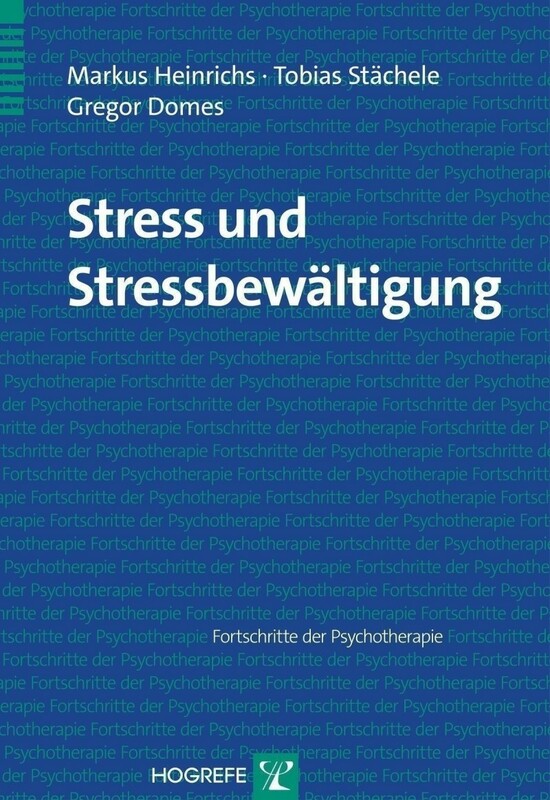 Stress und Stressbewältigung. Göttingen: Hogrefe. Heinrichs, M., Chen, F. S. & Domes, G. (2013). Social neuropeptides in the human brain: oxytocin and social behavior. In S. Baron-Cohen, H. Tager-Flusberg & M. Lombardo (Eds. ), Understanding other minds (3rd ed.) (pp. 291-307). Oxford: Oxyford University Press. Heinrichs, M., Chen, F. S., Domes, G. & Kumsta, R. (2013). Social stress and social approach. In J. Armony & P. Vuilleumier (Eds. ), The Cambridge Handbook of Human Affective Neuroscience (pp. 509-532). Cambridge: Cambridge University Press. Heinrichs, M., Chen, F. S. & Domes, G. (2012). Oxytocin. In S. G. Hofmann (Ed. ), Psychobiological approaches for anxiety disorders: treatment combination strategies (pp. 123-143). Oxford: Wiley-Blackwell. Heinrichs, M., von Dawans, B. & Domes, G. (2009). Oxytocin, vasopressin, and human social behavior. Frontiers in Neuroendocrinology, 30, 548-557. Soravia, L. M., Heinrichs, M., Aerni, A., Maroni, C., Schelling, G., Ehlert, U., Roozendaal, B. & de Quervain, D. J.-F. (2006). Glucocorticoids reduce phobic fear in humans. Proceedings of the National Academy of Sciences of the United States of America (PNAS), 103, 5585-5590. Heinrichs, M., Wagner, D., Schoch, W., Soravia, L. M., Hellhammer, D. H. & Ehlert, U. (2005). Predicting posttraumatic stress symptoms from pretraumatic risk factors: A 2-year prospective follow-up study in firefighters. American Journal of Psychiatry, 162, 2276-2286.